Just Garnet is one of my favorite dark, bold lipcolors. 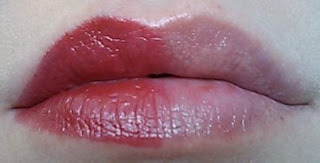 It is unique in that rather than diminishing the lip, as most dark colors do, it enhances and augments the perceived size. 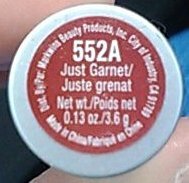 Just Garnet is a beautiful pomegranate red. 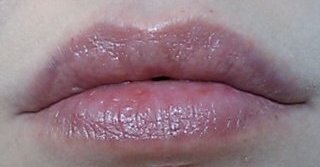 It does lean blue in the tube, but my coloring pulls it back to neutral on my lip. In the tube, it shows as a dark purple-red, with copper, silver, and pinkish shimmer, with a slight blue pearl sheen. On my lip, that shimmer and blue pearl disappears. Next is full lip. I applied directly from the tube to the bare side. This color goes on somewhat sheer, and builds with a few swipes. I don't find any need for a lipbrush. 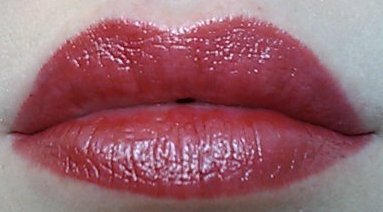 I had forgotten how much I like this color, and got a little excited when I was applying it, and lost a bit of control, which you can see on the upper lip, left side. So, do keep in mind that this is a bold color, and don't repeat my mistake. Apply carefully for a neat appearance.